As I experienced myself, when you are thinking too much and you are running in circles, your time would be better spent on doing things, meeting people, shaking hands, and so on. In most cases, your thought games are tricking you. You can never win. Your thoughts use your unclarity against you whereas the only way to gain clarity is by making an active effort to achieve revelation. An action does not always mean to do something physical. Taking action is when you push your thoughts out of your head into another medium. 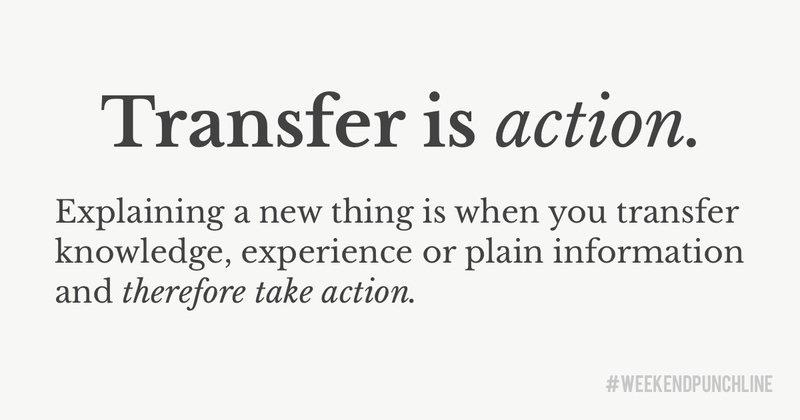 The transfer effort from one place to other is a way of taking action. If you explain something to me, you transfer knowledge, experience or plain information — besides the learning aspect. When you write out loud what is inside your head, you transfer from your head to your hands to the keys to the screen of your computer to your eyes and back into your head. That is an example where you create a self-closing loop which is why flow can happen relatively easy when writing. But it also includes the danger of writing and editing at the same time which is why a disconnect from the screen back to the eyes and brain needs to happen. Understand that taking action is not building the next iPhone or speak like Tony Robbins. It certainly is but in your position (an average person with above average ambitions, like me) you want to take baby steps and get your belly fat rolling. Do not think about the big things (yet). Forget to do something life-changing that has an impact on generations to come. Your task at the moment is to turn on the switch (Where is the on/off button again? Exactly). Spot your trigger. When found, press it and BOUM! There you go. Who Gon Stop You! The next time you feel uncomfortable because you are thinking too much, start doing something and then the right thing of action will come from the doing — and so will motivation. Do not get caught in the hamster wheel of your thoughts. It is dangerous territory and you will only hurt yourself. If you still struggle, „take your focus and shift it away from yourself“ (Sean McCabe). This was episode 35 of the #weekendpunchline . Every Saturday and Sunday. 158: Are you a firefighter or a harmony sheep?